Pearl Fernandez (center) and her boyfriend Isauro Aguirre (right) are accused of inflicting multiple injuries upon her son, 8-year-old Gabriel (left), including fracturing his skull, breaking several ribs and burning him all over his body. Gabriel was pronounced dead on May 24, 2013. LOS ANGELES – The prosecution announced Wednesday that it will seek the death penalty against a Palmdale couple charged with capital murder in the beating death of the woman’s 8-year-old son. 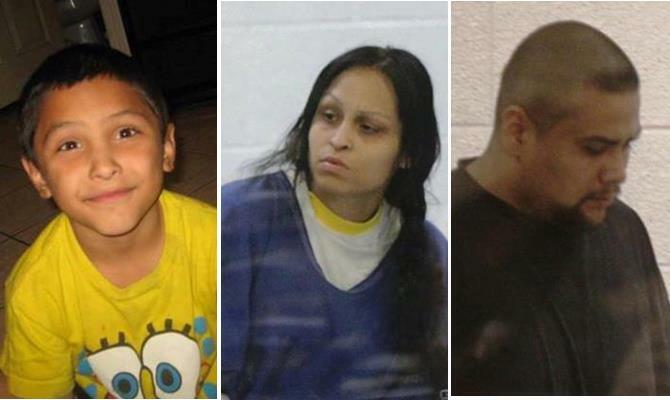 Pearl Sinthia Fernandez, 31, and Isauro Aguirre, 35, were indicted last summer in the May 2013 killing of Gabriel Fernandez, whose death triggered investigations into the county’s child welfare system. The murder count includes the special circumstance allegation of murder involving the infliction of torture. Fernandez and Aguirre are due back in a downtown Los Angeles courtroom July 14 for a pretrial hearing. The two — who are being held without bail — were initially charged in May 2013 with the boy’s killing. Prosecutors took the case to the grand jury last year to avoid continued delays in the case, Hatami said last year. Fernandez and Aguirre are accused of inflicting multiple injuries on the 8-year-old boy, who suffered a fractured skull, several broken ribs and was burned. Los Angeles County Fire Department personnel were sent on May 22, 2013, to a home in the 200 block of East Avenue Q-10 in response to a call that the boy was not breathing. Gabriel was declared brain-dead that day, but not taken off life support until two days later. In July 2014, the boy’s father, three siblings and paternal grandparents filed a wrongful death lawsuit against the county departments of Children and Family Services and Public Social Services, the Sheriff’s Department and the Palmdale School District. Fernandez and Aguirre were also named as defendants. The lawsuit alleged that the siblings, like Gabriel, were “compelled” by county officials to live with Fernandez and Aguirre and were also “physically and emotionally abused” by the couple. Family members, neighbors, teachers and others made more than 60 abuse reports to the proper county authorities, according to the lawsuit. County authorities previously said two social workers and two supervisors were ordered fired in the wake of the boy’s death. 14 comments for "DA to seek death penalty against Palmdale couple in Gabriel’s beating death"
Look at that precious boy. Omg. There’s evil in this world and no matter what happens to those two here on earth, they still have to go before the ONE judge one day. I pray that little Gabriel rests in peace. These stories of child abuse really break my heart. I don’t know how parents could even think about doing this to their child. It’s sad. May he rip. When you know that your days are actually numbered, the days are long and grim. Just imagine if you know the exact date and time that you will cease to live. Don’t trip they still have to meet there maker! The people at social services are very much responsible for this as well- 60 reports and this still happens? My heart hurts so much for this sweet boy & the rest of his siblings. Sending prayers and love to them. There are certain workers within the department that completely dismiss the fact that their colleagues screwed up. They are in complete denial. I was thinking the same thing. Let’s stone them to death! start off with the harshest punishment and then work your way down as opposed to start with the least amount of punishment. LOL…talk about political grandstanding! I’m almost certain that the DA is fully aware that as of this moment California has no death penalty law that has not been ruled unconstitutional, so all the “seeking” in the universe is not going to produce a death penalty in this case. Clearly this is just thrown out there as pandering to the “skip the trial and execute someone” fascists that are so vocal around here.